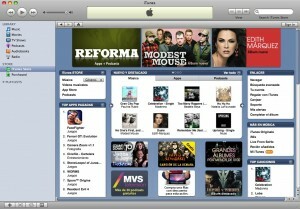 Apple has finally unveiled the Mexican version of its fantastic music service, charging $12 pesos per song and $24 pesos per video download. Prices vary according to artist and album, but you can get your own anywhere from $70 pesos to $140 pesos. The main screen opens in español, of course, with headliners such as Paulina Rubio and Alejandro Fernández.